The Fortnite Switch is available for pre-order now, and you might want to get in early if you fancy blasting fools while you wear your slick new Double Helix skin set any time soon. The $299 package is currently live for early purchases on Amazon, complete with optional release-day delivery, already making it one of the best Nintendo Switch bundles out there. Here's the link. Nintendo Switch: Fortnite - Double Helix Bundle for $299.99 on Amazon: Pick up a brand new Nintendo Switch console for playing Fortnite on the go and get a special character outfit, pickaxe, glider, and a bonus 1,000 V-Bucks all in one package. 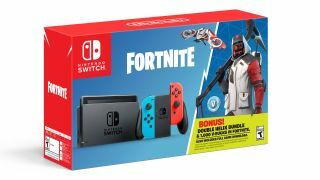 The bundle includes a Nintendo Switch system and dock with neon blue and red Joy-Cons, and a download for Fortnite. Granted, it's one of the best free games out there, so getting to download it isn't really a rare privilege. The special part that's probably going to make this bundle super hard to find over the holidays is the Double Helix Set: it includes a new Character Outfit, Back Bling, Glider, and Pickaxe. Alright, so the items aren't completely new - they're red and white versions of the pre-existing Archetype set - but I think I like these ones better. I always felt Archetype looked like this strange compromise between a special ops soldier and a regular at an industrial dance club. The Double Helix version, on the other hand, looks like a security specialist from a very clean and super dystopian future. A much nicer aesthetic as far as new colors go, at least in my opinion. And don't forget that all of those items will carry over to most any other place you play Fortnite, assuming you use the same Epic account (which rules out PS4, sadly). The Nintendo Switch: Fortnite - Double Helix Bundle also includes a quick cash injection of 1,000 V-Bucks, enough to get you a Battle Pass with a little left over. Assuming the Double Helix set would cost the same as the Archetype set in the Item Shop, it's a total value of 4,200 V-Bucks - or in real-world terms, roughly $42 on top of the Switch system. More importantly, you can't put a price on a bunch of internet strangers asking "how'd you get that skin?!?1?" Get some special skins for your actual body with our guide to Fortnite Halloween costumes and accessories.